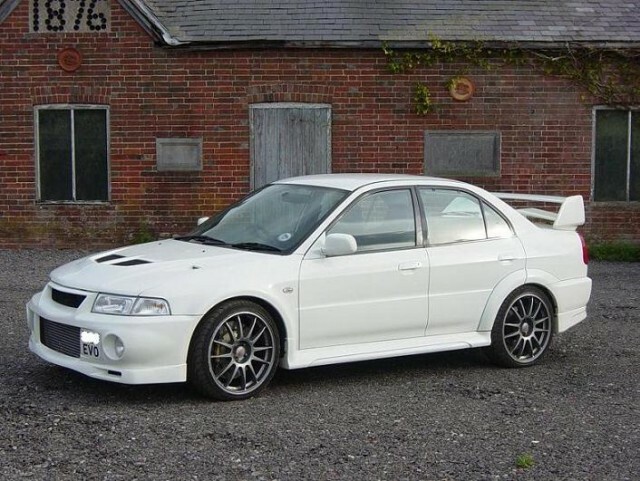 Evolution VI arrived with some fine tuning to its aerodynamics after changes in the 1999 WRC regulations restricted the size of aero attachments, and a dramatic improvement in cooling performance. Cooling was improved by offsetting the license plate and using smaller fog lamps to enable the effective area of the bumper openings to be enlarged, while new ventilator and airflow ducts in the bumper enhanced the performance of the oil cooler. Drag was reduced with the use of hemi-spherical fog lamp covers, while the introduction of a twinwing reardeck spoiler design made up for the reduction in downforce resulting from its smaller size. Evolution VI's engine generated the same maxima as its predecessor but detail modifications improved reliability and response. A titanium-alloy turbocharger turbine - a world first - on the RS model improved throttle response, while the addition of a cooling channel in the pistons improved reliability. Increasing coolant circulation by changing the layout of the coolant passages reduced cavitation. Improvements to the oil pan baffles and the use of an uprated oil cooler stabilized oil temperature at high engine loads. Detail changes to the suspension included: greater stiffness resulting from the use of forged front knuckles, and a lowering of the roll center by transferring the ball joint from the forged aluminum lower control arm to the knuckle, both resulting in better tire-road contact. At the rear, the use of forged aluminium for the lower control arms, trailing arms and toe control arms reduced the unsprung weight of the vehicle. A longer rebound stroke also improved tire-road contact. Body stiffness was increased with an additional 130 spot welds, the use of structural adhesive and the use of thicker gauge sheet metal in some panels. These detail changes enabled Evolution VI to achieve new peaks in terms of response, grip and handling stability.